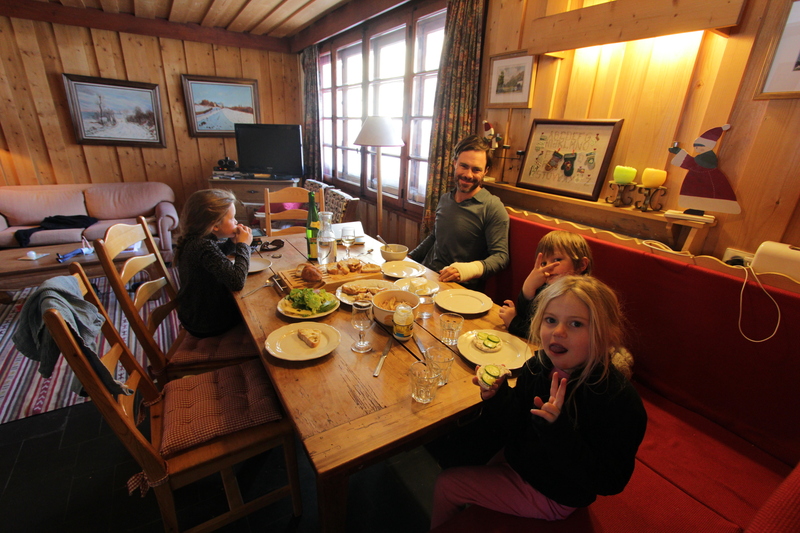 After dropping the kids off at ski lessons, we went to the supermarche to pick up some fresh bread and supplies, and then went back to our chalet. 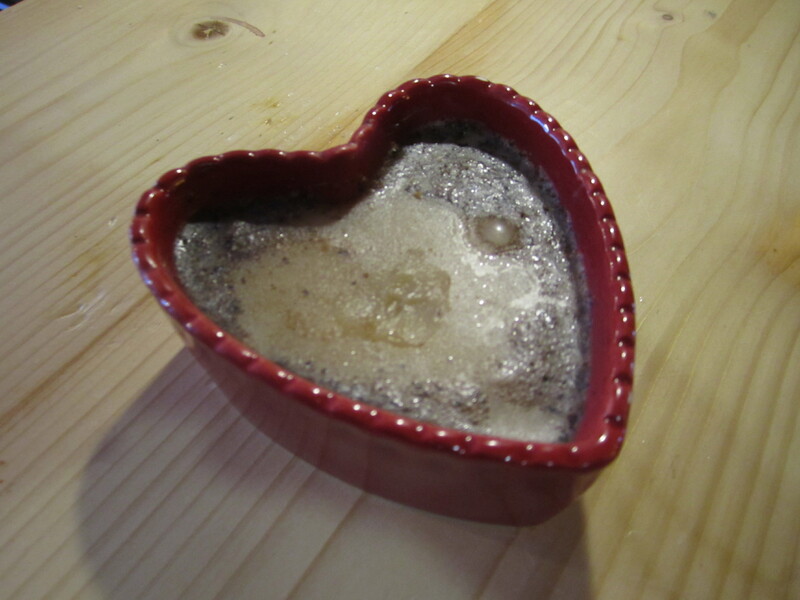 We made a fresh pot of coffee, sat at the kitcen table and had a long chat. We’ve slipped into a way of life worlds away from the hustle and bustle of school drop offs, gymnastic lessons, and responsibilities that involve anything that doesn’t revolve around us. Is it boring? No. Too much family time? I haven’t noticed. If anything, it’s a decadent abundance of time. This moment is a temporary luxury and I know it. 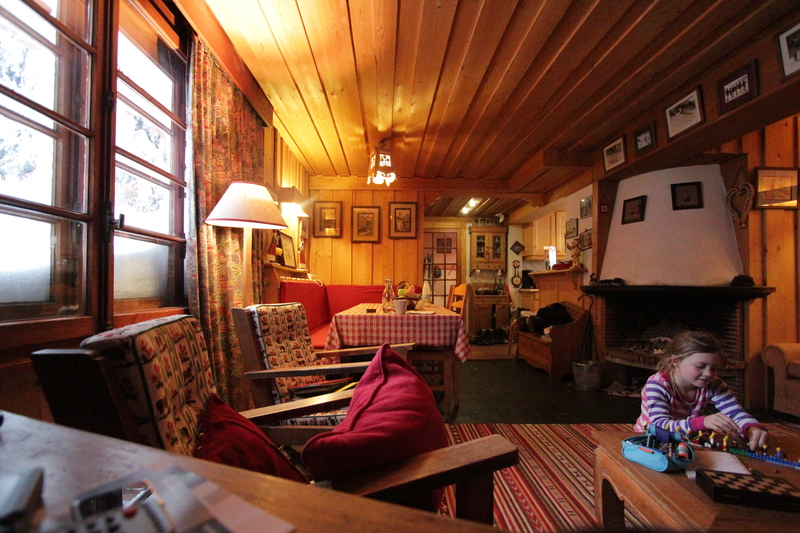 We’ve rented a cozy little chalet (50’s era?) which is fashioned in a kaleidoscope of french patterns. Finally a kitchen that’s all mine and laundry…the luxury. we’re always living out of a bag, but every so often it’s nice to unpack and spread out, and we have. I’ll never find all our bits and bobs. This house feels like home and it’s nice to stay in one place for a little while. 19 days, expected to be the longest of the whole trip. The mainfloor is cozy with kitchen and livingroom, the mid-floor three bedrooms, and then on the third level is an attic with low, kid-friendly ceilings. 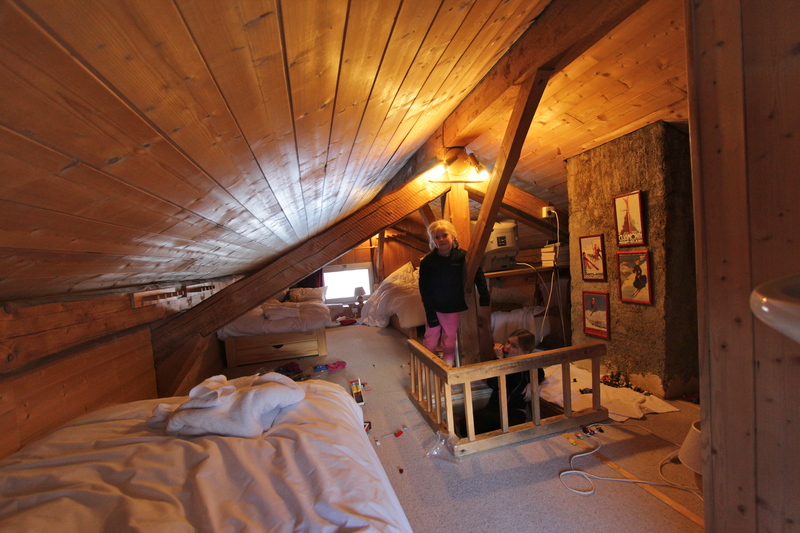 It has three beds up there, to access you climb a creaky ladder. The kids have redecorated with lego, and are in heaven. We’re in heaven too as they’re close enough, but just far enough away to not be heard. home sweet home. Finally I can cook! and all the kids want is pizza and spaghetti. Some things don’t change. Although as I’ve said before, the kids are pretty good about trying new things. Frog’s legs at new years (eaten, but everyone agreed the bones where a little creepy). Even in this french ski town, which is jammed with Brits, the stores are plentiful with all the trappings of delicious french local cheeses and meats. 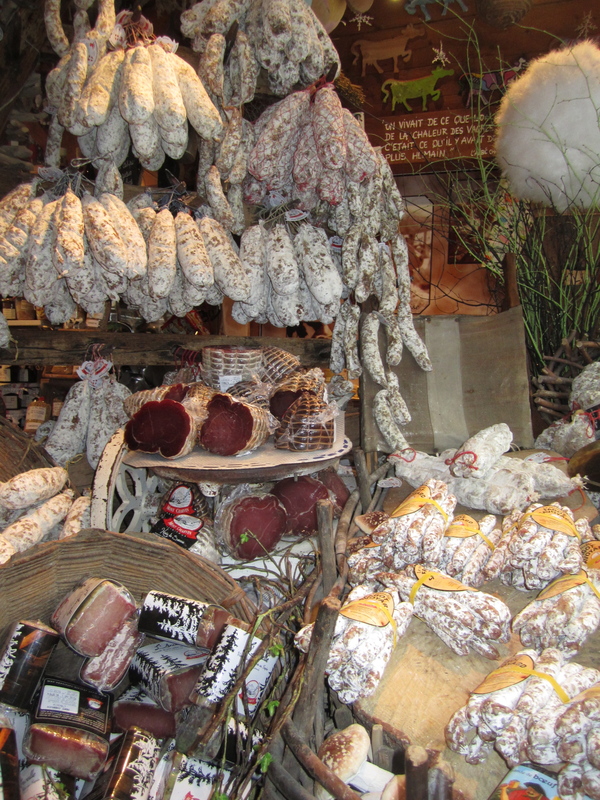 It’s easy to get excited when you see 10 kinds of saucisson and so many cheeses. I made duck al la Jess, and had all this delicious duck fat left over. We’ve attempted cooking from Pettit Larousse. It’s tout en francais, et tout metric…so essentially I wing every recipe. Some success (poulet a l’estragon) some failure. Cover anything with smarties, smother it in butter-cream icing, hide money inside and even the toughest and driest cake can persevere. It’s been snowing for days. 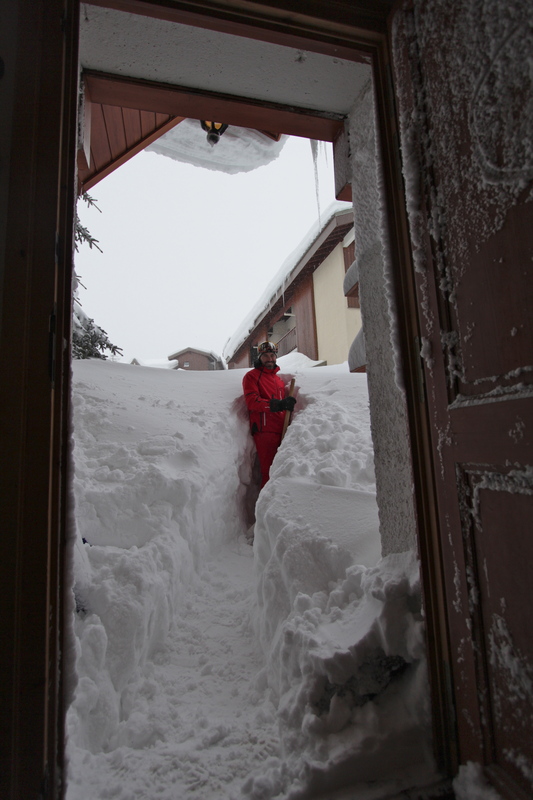 100km winds have pelted down over a meter of snow onto this little town of Val D’isere. The road was closed due to avalanche and there’s more snow whipping about then I’ve ever seen in my life. 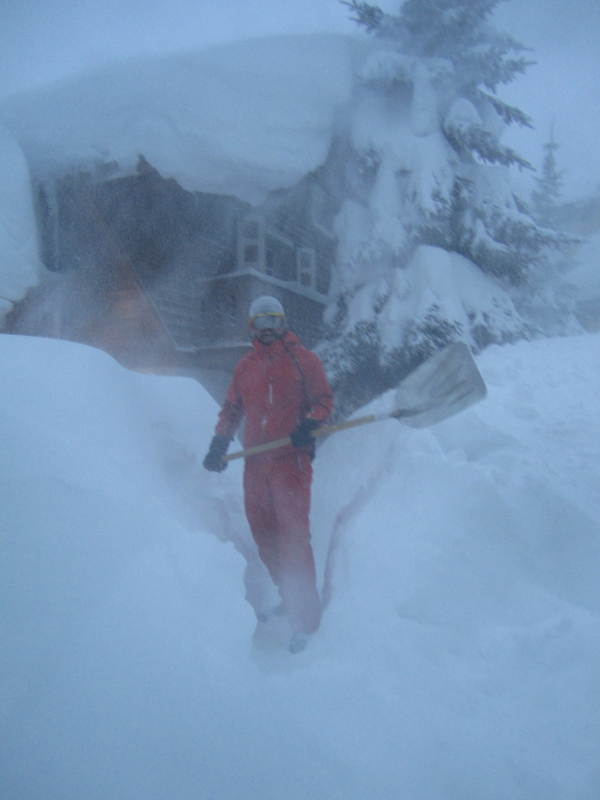 Don shovelling a path to our house during a big storm. Digging out again after the storm. Every morning we wake up around 7.30, start the fire, warm hot milk and put on the kettle for our french press coffee. The kids come tumbling down the ladder. First Ash, then Kate, and as always Gwen last. French toast for breakfast, wrestle Ashton into his long underwear while he dances around singing (why can’t he just stand still for 10 seconds???) The kids unload the dishwasher, Don madly searches for houses abroad for us to rent in the coming months (today it’s south america….have I mentioned how lucky i am to have a research analyst for a travel partner). We’ve discovered that we prefer to just make it up as we go. Do you want to go to Paris or Berlin next? hmmm. lets think about it. Then we go skiing!! 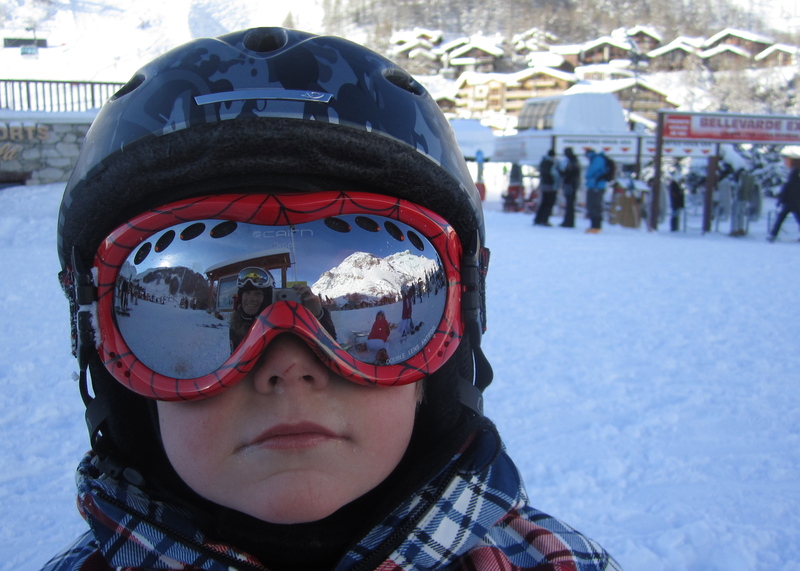 Don above the town of Val D’Isere before the incident. 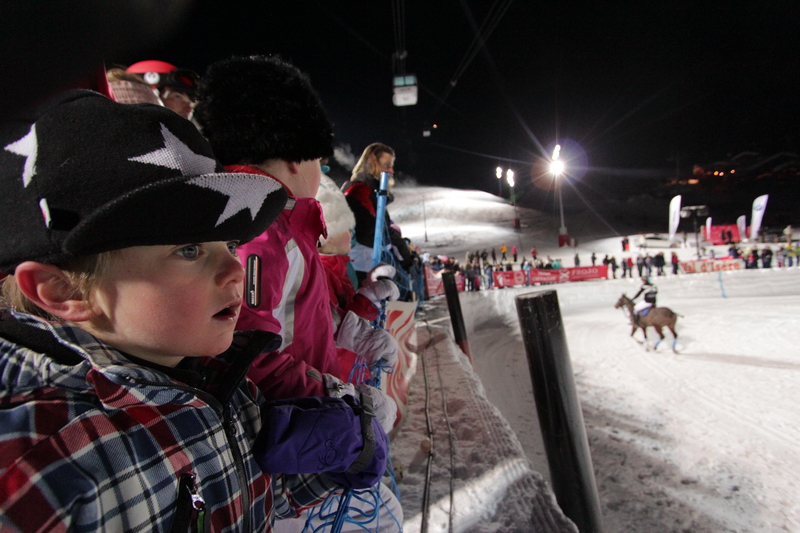 Val D’isere is the perfect family ski area. 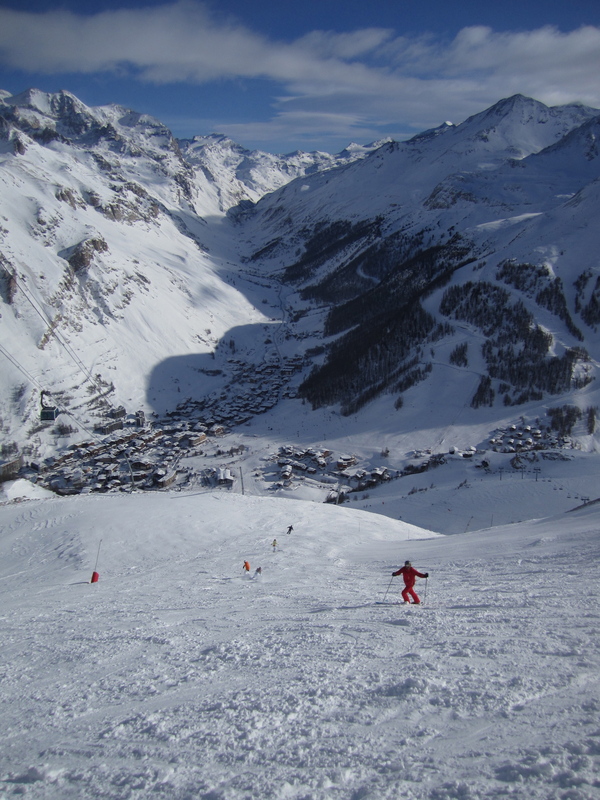 Like Courcheval, Val D’isere is large with 300 km of pistes. 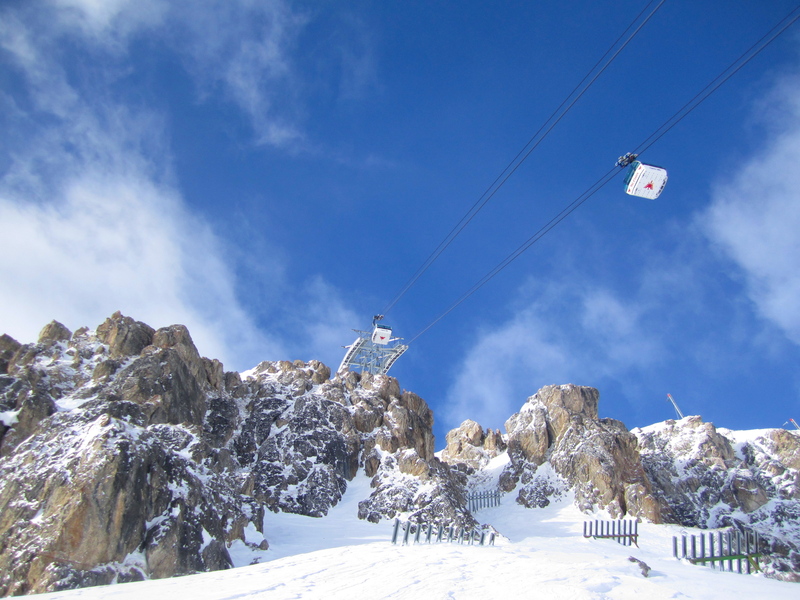 Its peak sits at 11,500feet (3550m), so the snow is cold and powdery…no snowmen here. 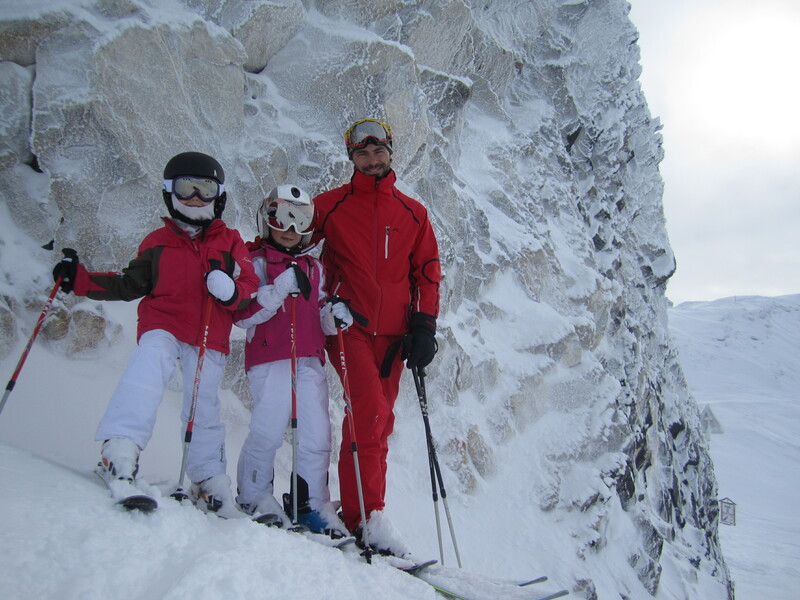 What are the biggest differences about skiing in Europe vs Whistler? Yes, there are many, many more lifts, relatively no people, and dusty snow, but the big difference is the on-mountain dinning! Seriously outrageous! Veuve Cliquout Champagne as decor? blasting beats?, delicious Savoie food? are we in a dance club? No, just having lunch! The atmosphere is festive. It also helps that when it’s not snowing, it’s sunny and everyone is outside dancing around in their ski boots. Gortex is welcome, not as much fur and leather around here. 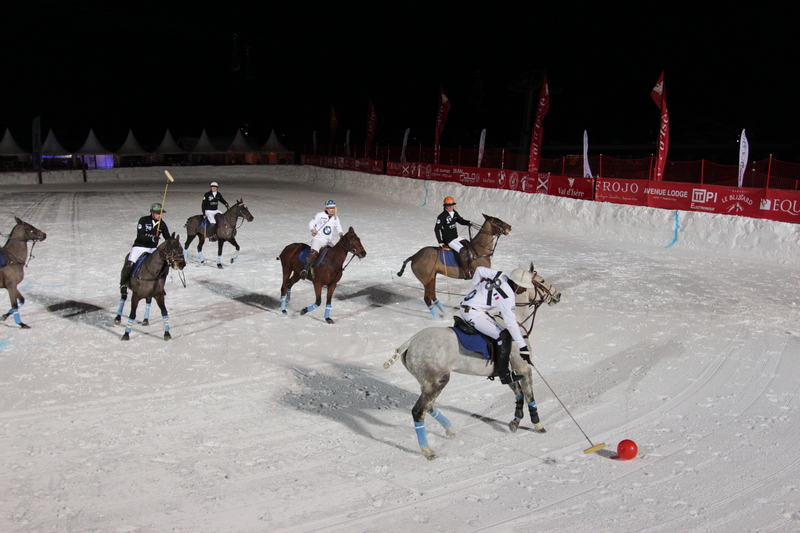 Snow Polo, who knew? A terrifically exciting and somewhat violent game. 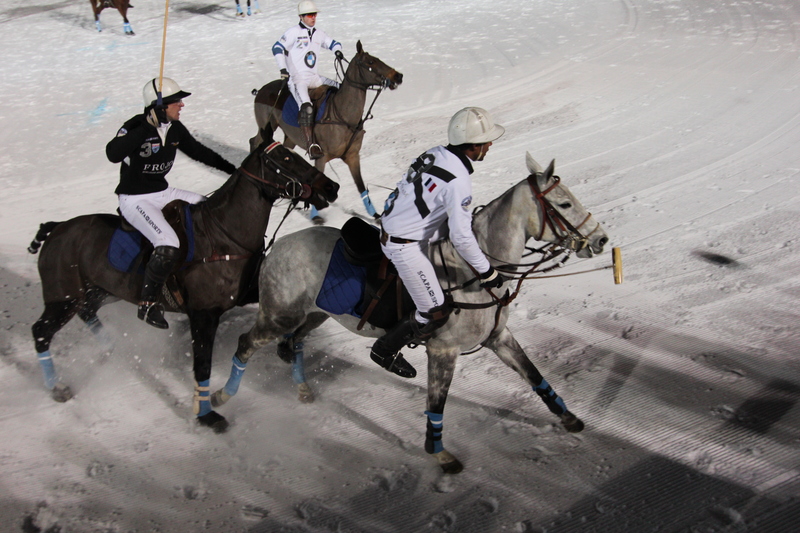 The horses’ coats are shaved into intricate patterns and they don’t seem cold in the chilly -15c. 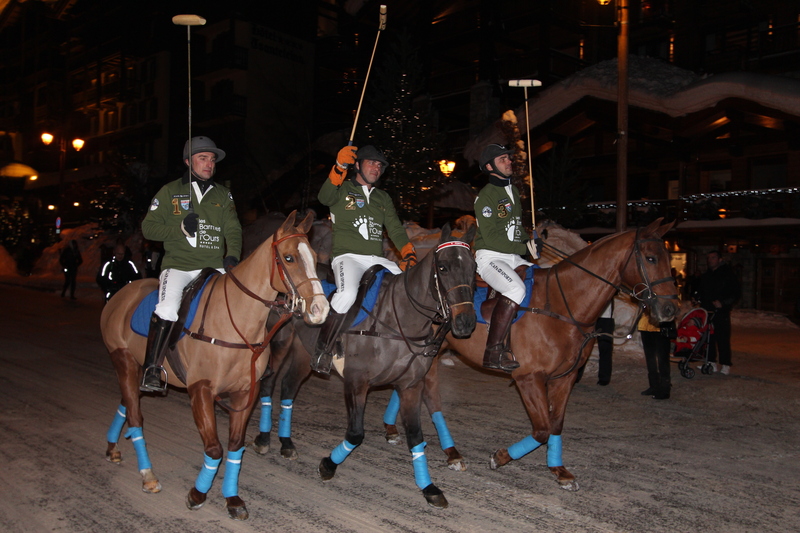 Each of the six competitors change their horses every ~10mins. the whole thing is very cool. and of course, champagne and euro-beats included with every match. 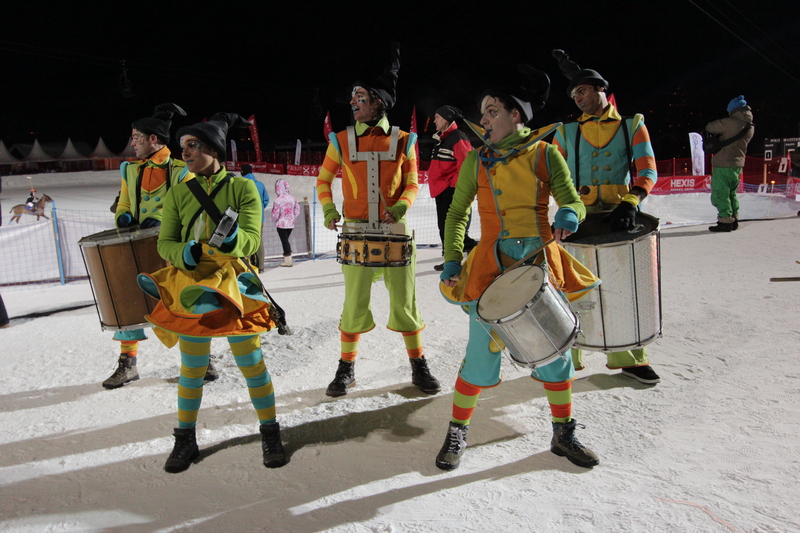 French music band, found banging out music at any event. 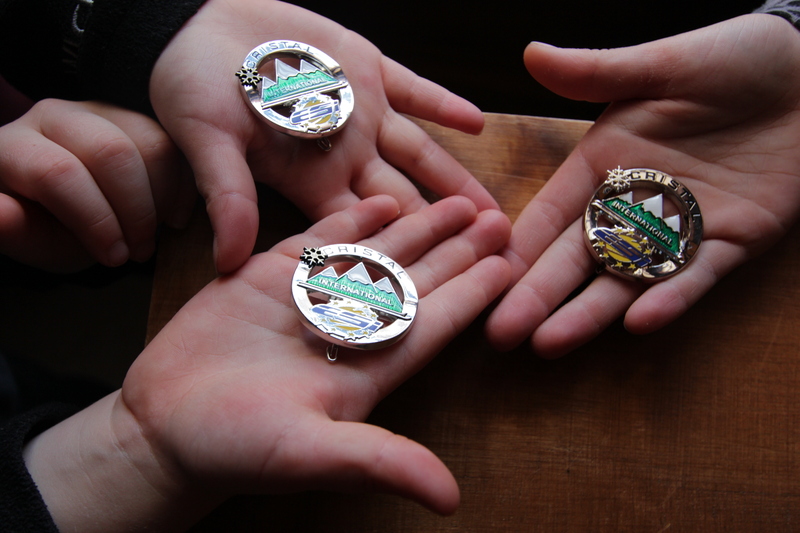 Medals given for each passing their ski levels (Gold, silver, and bronze levels). 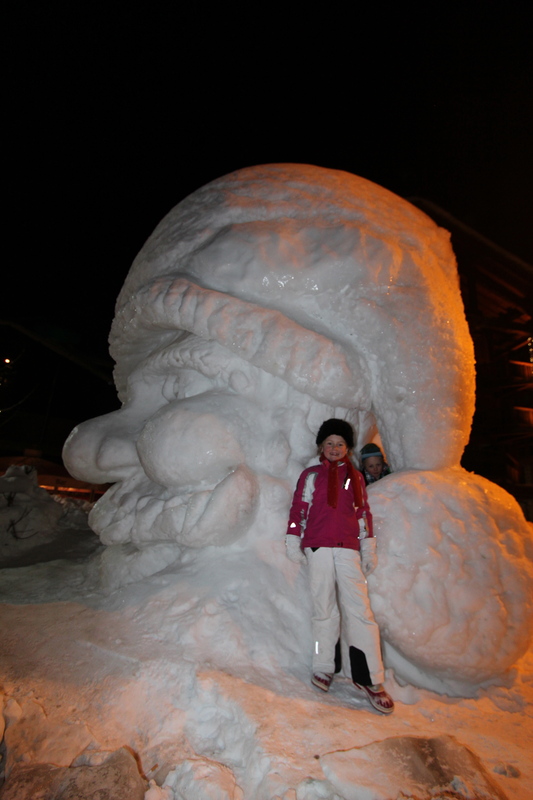 snow sculpture of St. Nick on main st.
On what was a lovely day skiing (sans kids) through deep powder, Don hit a wind lip and smashed his hand against the wind-blown snow. 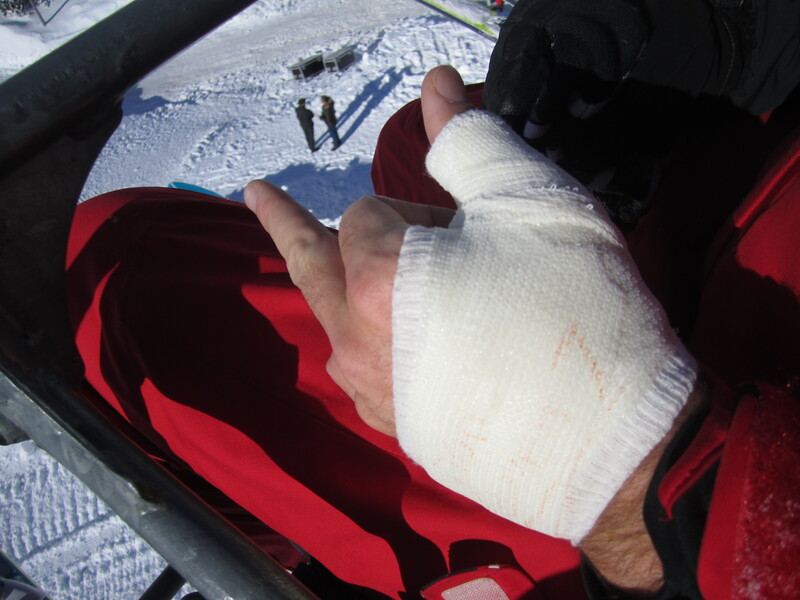 The result was a chipped thumb bone and an operation to reattach the ligaments to the thumb. The French doctors got the job done, but he has to wear a resin cast for the next five-six weeks (it’s supposed to come off when we are trekking somewhere in Africa). Don being Don, insists that he can ski, and he can, and does, with one pole so that he can push himself on the flats. 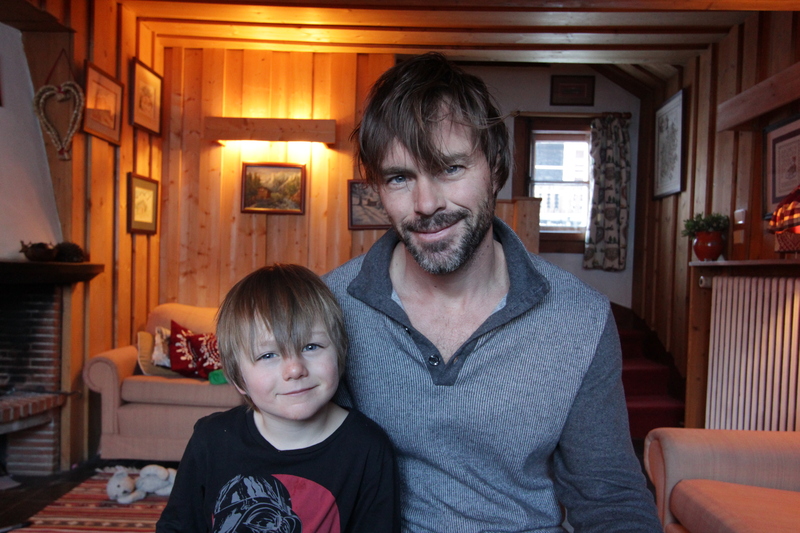 love your video, wow, so much snow, almost scary. The kids are skiing so well, very impressed. Love that you are flexible, specially with Don’s thumb….drat. Off to Sayulita on Saturday for 3 weeks, can’t wait, though it is snowy here and quite lovely too. 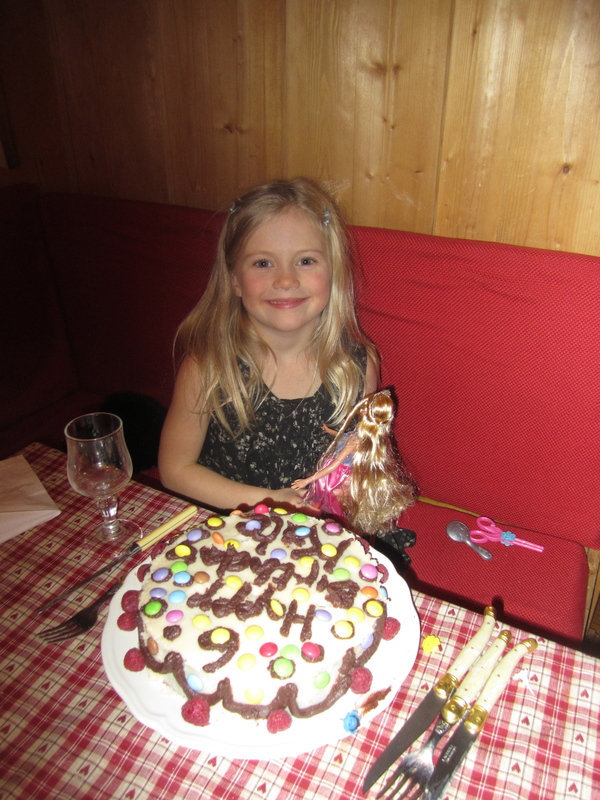 Kate, joyeux anniversaire! Vous avez un beau gâteau! That sure is a lot of snow! Congratulations on your ski badges. Thomas was skiing here at Mount Pakenham. 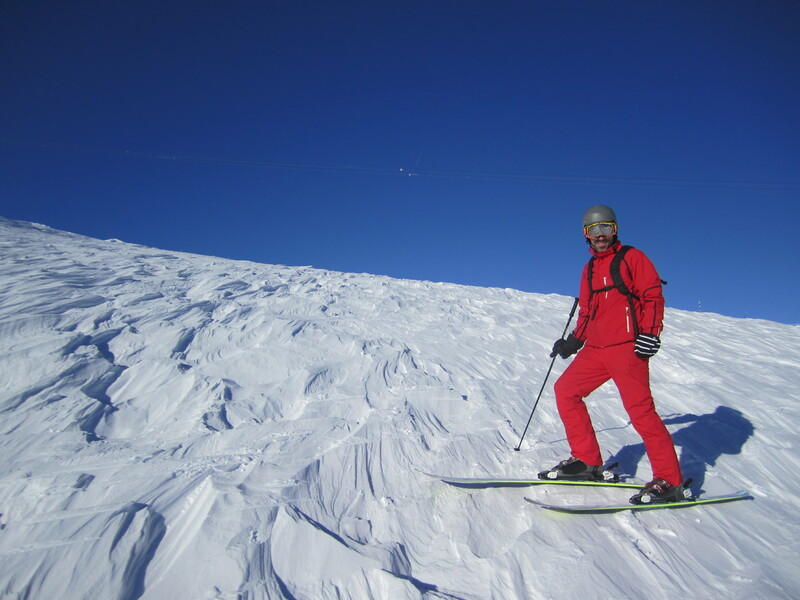 It’s summit elevation is 223m which is just a bit smaller than what you have been skiing on. Tee hee. Ouch! Hope your hand heals quickly Don.